Since I came here in Paris, I have met this Nature statue many times. 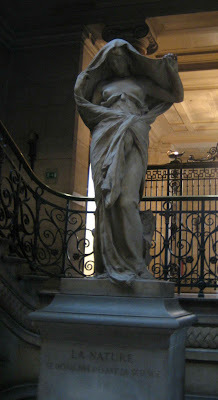 It is placed in the hall of University of Paris V. On the way to the medical library on the second floor, I passed by in the beginning without realizing this is the famous statue of Nature. If you look round closely, there must be many interesting things around us in this city. The following is the explanation from the site of Musée d'Orsay. For the statue at Musée d'Orsay.